Who invented the Sewing Machine? The name of the person credited with inventing the Sewing Machine is Elias Howe (1819 - 1867) who revolutionized the clothing and shoe industry. Elias Howe is not only famous as the American inventor of the Sewing Machine but also as a machinist, businessman and entrepreneur. When was the Sewing Machine invented? Elias Howe patented the world's first practical sewing machine in 1846, during the First US Industrial Revolution (1700 - 1860) period of invention. The invention of the Sewing Machine originated in America and is considered a leading technological achievement of its time. Definition of the Sewing Machine: The Sewing Machine is defined as a textile machine using a needle and thread for making or repairing clothing. Fact 1: Who invented the Sewing Machine? The Sewing Machine was invented by Elias Howe in 1846 during the First US Industrial Revolution era of inventions (1700 - 1860) and was a standout technological advancement of the era. Fact 2: Who invented the Sewing Machine? Prior to the invention of the Sewing Machine in 1846 the task of making shoes and clothing was a time consuming and labor intensive task. The invention enabled ordinary people with the means to buy a variety of cheap, fashionable clothes. Fact 3: Who invented the Sewing Machine? Other inventors had made sewing machines but the devices all used the chainstitch that used a single thread that was easily unraveled. The Elias Howe sewing machine was different. His sewing machine used two threads forming the lockstitch, a mechanical stitch made by the sewing machine which firmly linked the two threads together. Fact 4: Who invented the Sewing Machine? The inventor of the world's first practical and successful sewing machine, Elias Howe, was born on July 9, 1819 in Spencer, Massachusetts, United States and died on October 3, 1867. Fact 5: Who invented the Sewing Machine? The early years of Elias Howe were spent on the family farm in Spencer, Massachusetts, United States where he was raised on the family farm. Elias Howe received a basic education but was an extremely intelligent child. Fact 5: Who invented the Sewing Machine? Following his education in 1835 his first job was as an apprentice in a textile mill in Spencer, Massachusetts where he learnt the skills of a machinist. Fact 6: Who invented the Sewing Machine? The textile mill closed in 1838 and Elias Howe moved to Cambridge, Massachusetts work for Ari Davies as a mechanic with carding machinery that separated and straightened wool fibers. 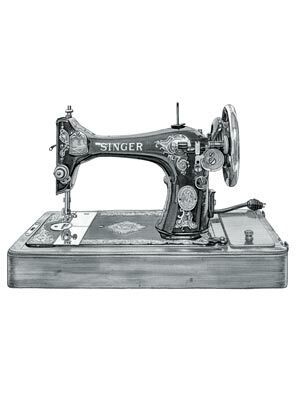 Fact 7: Who invented the Sewing Machine? The customers of Ari Davies all worked in the textile industry and before long Elias Howe realized that there was a need for a machine that would sew quickly and efficiently. Elias Howe also realized that such a machine would make him a very wealthy man. Fact 8: Who invented the Sewing Machine? In 1841 Elias Howe married Elizabeth Jennings Ames and settled into family life. The couple would have three children, Jane, Simon and Julia. Fact 9: Who invented the Sewing Machine? Elias Howe knew that his idea to invent a practical Sewing Machine was a good one He developed his idea in 1843 when illness kept him from his job for days at a time. Fact 10: Who invented the Sewing Machine? By April 1845, Elias Howe invented his first machine that was used to sew all the seams of two woolen suits for men’s clothing. Fact 12: Who invented the Sewing Machine? The patent application for the Elias Howe Sewing Machine described the use of the eye-pointed needle in combination with a shuttle to form a lockstitch. Fact 13: Who invented the Sewing Machine? The invention of the lockstitch Sewing Machine was not the success that Elias Howe had hoped for. Not one U.S. manufacturer was interested in his invention. In 1846 he traveled to England hoping and English manufacturer would be interested in his Sewing Machine. Fact 14: Who invented the Sewing Machine? Whilst he was in England Elias Howe met William Thomas, a corset manufacturer and the owner of W. F. Thomas & Co. 1 Cheapside, London. William Thomas purchased the British rights to Elias Howe's patent for £250. In 1846 Elias Howe patented an "Automatic, Continuous Clothing Closure" but the device, the forerunner of the zipper, was never seriously marketed. Elias Howe worked with William Thomas until 1847 when he decided to return to the United States. Fact 15: Who invented the Sewing Machine? Upon his return to the United States he was horrified to learn that his patent for the invention of the two threaded lockstitch Sewing Machine had been infringed by Isaac Singer (1811 – 1875), the man who went on to establish the Singer Sewing Machine Company. Fact 16: Who invented the Sewing Machine? Elias Howe battled against Isaac Singer and was forced to defend his patent in a court case that lasted from 1849 to 1854. After many years of legal tensions, Elias Howe won patent protection in law courts and started to get compensation and royalties for his invention. Fact 17: Who invented the Sewing Machine? Elias Howe may have been the first American inventor of the practical and successful sewing machine, but it was Isaac Singer who made it it a household name. Fact 18: Who invented the Sewing Machine? Elias Howe became one of the richest men in America. Despite his great wealth Elias Howe enlisted as a private in the American Civil War (1861 - 1865). Elias Howe survived the horrors of the bloody conflict and returned home to his family at the end of the war. Fact 19: Who invented the Sewing Machine? Elias Howe died at the age of 48 on October 3, 1867 in Brooklyn, New York. His invention of the sewing machine had revolutionized the clothing and shoe making industry. Fact 20: Who invented the Sewing Machine? The invention of the Sewing Machine made a massive difference to the amount of time it took to make clothes. Prior to his invention it took 14 hours 26 minutes to make a Gentleman's shirt by hand, the Elias Howe sewing machine slashed the time to just 1 hour 16 minutes. Impact: How did the Sewing Machine impact the world? The Elias Howe two threaded lockstitch Sewing Machine resulted in increased sewing speed leading to cheap production costs. It significantly decreased the time required to produce an item of clothing which led to the availability of ready-made clothes. Because clothing was low cost and could be easily replaced, it led to a rise in the interest and desirability of fashion and millions of new jobs were created across the world.